Alzheimer's & Dementia Weekly: How Much Coconut Oil Helps Alzheimer's? How Much Coconut Oil Helps Alzheimer's? MCT oil generates ketones, which can help dementia. Coconut oil is rich in MCT oil. What are healthier food sources? How much is a good daily amount to get the maximum benefit? Check out the table, links and comments below the video for a better understanding of coconut oil's benefits for people with dementia. 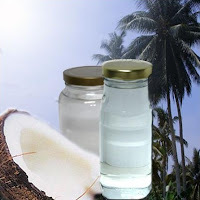 Coconut Oil for Alzheimer's & Dementia Library. The following is not medical advice. Be sure to consult your physician before trying this yourself. You may start with one teaspoon of coconut oil in each meal. If available, use a mixture of 1/2 coconut oil and 1/2 MCT oil. Increase the amount gradually, protecting against side effects. Try to get as much as 3 tablespoons per meal and two tablespoons at bedtime. I have MCI and when I started using Coconut oil & MCT I started gaining weight. It freaked me out and I stopped. At one point in my life I had lost about 100 lbs and so I am very worried about gaining weight. I have been a Vegan for 5 or 6 years and am very aware of what I eat. I make sure to get enough protein everyday and for the first time since I lost the weight, I do not have to worry as much about my weight, but to consume that much Coconut oil per day, I have to eat less or omit other very healthy foods.I try to sneak a Tablespoon in some days, but if I try to consume the recommended amount, I start gaining weight (I also exercise regularly). I wanted to add that I am female (my husband must have set up FB in his name). My name is Pat and I am 66 years old. The best way to deal with this is to Substitute coconut well for other fats in the diet and to reduce portions of carbs. Steve had Alzheimers so we were maximizing how much of these oils he was getting. I don't think that people looking for prevention would need to take as much as he was taking. I usually suggest somewhere between 3 and 6 tablespoons a day for prevention. This is about 400 to 800 calories A-day. If someone is on a 2000 calorie diet it should be relatively easy to work that in and figure out what foods to eliminate to maintain weight. Another alternative would be to take 2 to 4 tablespoons per day of MCT oil although I do think some whole coconut is beneficial because of the many other nutrients could be factors in memory and other health benefits. I hope this helps. That should say coconut oil!! Coconut oil or MEDIUM Chain Fatty Acid, (... as in Omega-3 Fatty acid from Salmon, and Animal Fat), CANNOT POSSIBLY be the cause of weight gain... why? FAT DOES NOT MAKE YOU FAT....Basic Bio-chemistry!!! MCFA = does NOT utilize INSULIN, the Fat Storing Hormone. PERIOD. Comrade, fat does not make you fat by itself, but calories + insulin will and the calories can come from anywhere. And the fat doesn't drive the insulin (as you probably know). So the real question is what is going on in the diet besides the fat. How many tablespoons of MCT oil should be taken a day if you already have dementia/ahzheimer's? What is the best way to take it? Can it be taken in juice?